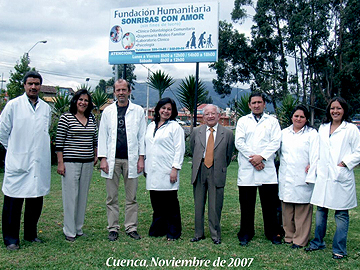 In 2007, we coordinated the visit of the Swiss volunteer dentist, Dr. Thomas Ross. He treated school children free of charge while working in the clinic for two full weeks. 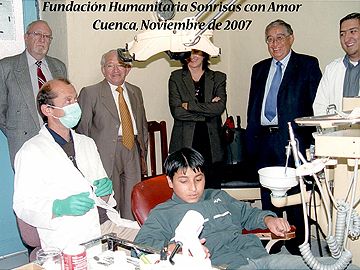 At the request of Margarita Heredia Forster in November 2007, I visited this Foundation with the aim of supporting their Dental Department. 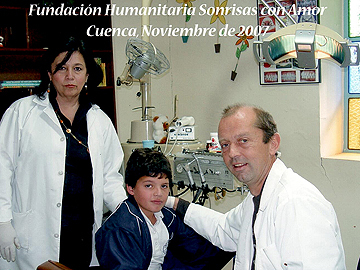 From my perspective as a Swiss dentist from Herrliberg, it is admirable with how much heart and work the residents of Cuenca are helped. 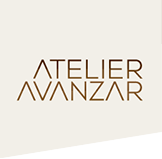 Under the leadership of Dr. Polivio four dentists work in three different locations. The dental clinic is very rudimentary. There is a lack of basic instrumentary such as an X-ray equipment, new surgical lights and a sterilizer for each location. 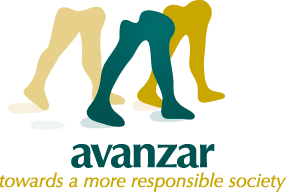 During my visit I tried to analize the work as well as the organization and made suggestions for their optimization. I hope in the meantime some of my suggestions have been implemented. With little money and a strong leadership, it would be possible to reach a lot. I would be happy to visit "Sonrisas con Amor" again and would like to thank all my colleagues and speciall thanks to the Heredia family for the warm hospitality during my visit.